Allow me to start by saying that I hate my lighting and crappy camera, I really need to get both of these sorted one of these days. No point in nagging about, so let's move on to a quick pic of the 'lil' fellah I'm using as my combat servitor. Who needs a powerfist when you have a nice executioner-style choppy thing, massive muscles and enough cybernetics to make Arnold jealous, right! - Dwarf Flesh basecoat, followed by a second layer of 75/25 Dwarf Flesh and Skull White (while avoiding the recesses for a more natural colour transition in subsequent layers). 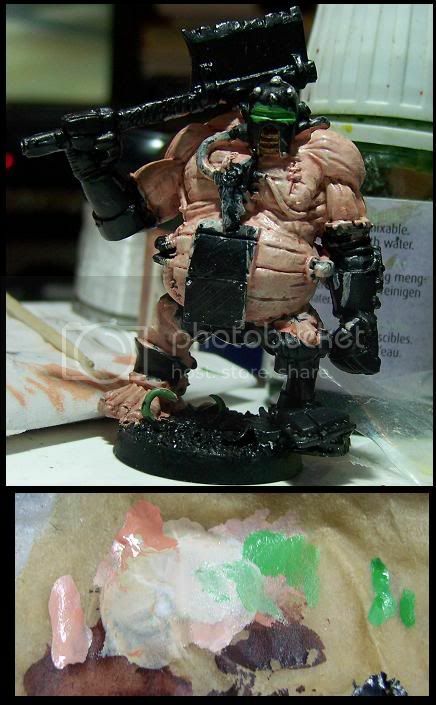 - After this a tiny bit more Skull White and some Rotting Flesh were added to the mix and 2-3 highlights followed. - After this several glazes using the new GW inks were added (just brown ink), as well as a few ones using purple drawing ink. Trust me on this, purple ink when used in moderation and only in the deepest recesses can really make flesh pop. So next I need to sort out some of the tricky bits and bobs before any other major area can get attention, there are just a few tricky cables on him. Once that is done I can get started on the cloth areas, main metallic segments and a few extra skin glazes.